During Carb oniferous times, the deltas and floodplains of the Huddersfield area were periodically covered by the sea. Marine fossils found locally are evidence that this sea was rich in life. 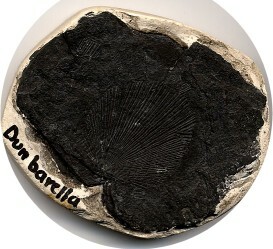 Dunbarella was a thin-shelled bivalve which probably swam through the sea like present day scallops. Another shelled animal was the brachiopod Lingula. Goniatites, the ancestors of ammonites, were free-swimming marine animals. They could propel themselves by squirting streams of water and would have moved jerkily. Goniatites are small in size. Goniatite fossils, along with bivalves and brachiopods are found in beds of shale known as marine bands. Examining fossils with a hand lens will enable you to see the fine ornament which is characteristic for each species and each marine band. These fossils are therefore particularly useful for dating and comparing rock strata between different locations. Goniatite Gully on Pule Hill (left) is a well exposed marine band. There is also an exposure of a thin marine band near Brockholes. Preservation: Shells themselves can be preserved directly by rapid burial in sand or mud. In other cases the shell dissolves, leaving a mould in the rock which is subsequently filled with silica, calcite or pyrite to produce a cast. Sometimes after the shell is buried, calcite or iron minerals can accumulate around the fossil and form nodules. Those made of calcite are called bullions and often contain uncrushed goniatites, examples of which have been found at Scammonden Reservoir. Ironstone nodules are common in both shales and sandstones and are often found with Carbonicola fossils in the coal measures. Carbonicola was a fresh water bivalve, shaped rather like the present day mussel. Most fossils are compressed when the sediments become compacted by further burial. This flattening and distorting can make them difficult to identify. Sandstones sometimes record evidence of animals living in or on sandbanks of deltas. 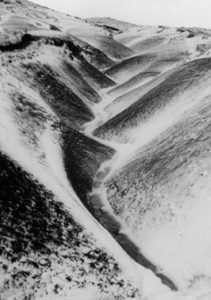 Feeding tracks of invertebrates show as irregular furrows in the sandstones and both worm burrows and worm casts are often found. These are known as trace fossils. Fossils represent only a fraction of the animals and plants that would have lived in the Carboniferous deltas and seas. Some creatures would have been preyed upon by predators such as large active shark- like fish with fins supported by spines and tough, scaly skins. The jaw of a shark-like fish fossil called Edestus Newtoni (see Picture right) was found in 1915 during the sinking of a well at Rock Mills near Brockholes. 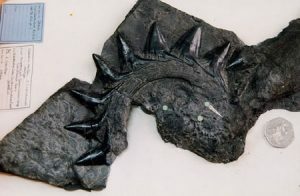 It was found in the shales below the Rough Rock and was presented to the Museum of Natural History by Elon Crowther, a director of the firm Sykes and Co. The fossil is now held at the British Geological Survey headquarters at Keyworth, Nottinghamshire. We have included a sketch of this fossil in our logo. Marine bands can therefore be traced across Northern Europe from Britain to the Ukraine. W.S. Bisat published the fundamental paper, after years of research in Yorkshire and Lancashire, distinguishing and naming the important goniatite species, which enabled geologists to correlate the Millstone Grit strata with confidence.